A powerful and respectable, dynamic and zealous website to reflect all your efforts and dedication to whatever you are doing can be the cornerstone of your leadership in the digital market and attract a wide array of new clients and customers, followers and readers. In this relation, WordPress – based templates deem to be some of widely applied ones due to their fantastic accessibility and admin – friendliness, granting anyone with a boundless capacity of crafting a unique way to grab the website visitors’ attention and converting them into much- wanted leads or credible subscribers. 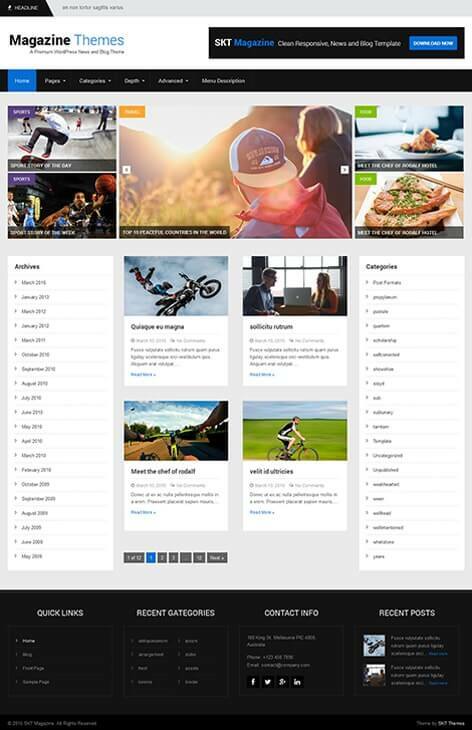 A template for absolutely any purpose or vision, starting from narrowly personal or individual to global and corporate, business or consulting, service provision or sales, anything can be found in today’s repository of WordPress templates. Hence, those suitable for blogs and online publishing practices have not been left out either. We at SKT Themes have put a big deal of time and energy into processing and development procedures of free magazine WordPress theme called SKT Magazine to make your online magazine, journal or news website’s or blog’s identity pop. And although this top – rated and error – free, totally elastic and flexible, smart and secure, as well as fully – fledged template has been coded to cater to all the needs and prerequisites of any online magazine or blog, it can be used equally well for other undertakings as well. Warm up your website with the most entertaining and eye – catchy visual traits, show off your content in a nicely – categorized and subcategorized manner for convenient content reliefs for each and every website viewer to find the requested section or article in a twinkle of an eye. Feel fortunate enough to have this multifunctional framework based on do – it – yourself approach without spending a single penny on it, neither when purchasing, nor while customizing and managing it. Tap into the power of online publishing and presenting breaking news, successful interviews and novelties, discoveries and worldwide events with right content classification and serve them to your reader – base. This can be a top priority for lots of people and journalists, editors and authors who venture to start something new and provocative in the digital arena and conquer new heights coming down the pike. Take all the matters into your own hands and give rise to an absolutely bewitching and haunted online informational platform, run your own digital store and sell your products, projects and services easily, drastically break all the stereotypes leading to plain texts and boring look of the website and make your own one with special charm and unique digital personality with ease. What is so pleasurable about this balanced and authoritative template is that it requires too little setup and further customization to be revealed fully, so that each website viewer can catch a glimpse of it as soon as the latter appears on your homepage and is greeted with hospitality. This professional and amazingly elastic, wonderfully pliable and smooth free magazine WordPress theme together with its solid foundation proudly stands up to all its qualities and keeps them at the highest level all the time. With this template any digital publishing tip you exercise online will help you seamlessly identify your mission towards your diverse groups of readers with pretty little endeavors, since the specialist of the theme have done the hard work and left the easy for you to complete as per your wishes and propensity. Hence if you are eager about having exclusive fingerprint for your online magazine or periodical, publishing or review website and keep it alive every day without any insurmountable motion or operation, here is SKT Magazine at your fingertips to go live and keep you top status for a long time. This well – structured and vibrant, enthralling and unfluctuating free magazine WordPress theme is ready – made to visually and functionally conform to your priorities in order to establish your dominance in your industry and bring more qualified traffic to your online magazine or personal blog. Hence it comes bundled with competent and modern design and is based on a durable Customizer to make changes, select categories and setup your content of any nature or kind with few simple clicks. Based on HTML 5 and CSS 3, SKT Magazine feels equally well meeting all the major demands of the current digital realm, as well as contemporary WordPress community standards, tailored to the themes’ inner capacities to their visual markups. Tons of new shades and functional extensions can be added to the existing functionality of this free magazine WordPress theme to promote your profile out of your website’s borders in diverse social mediums and platforms as well. Specifically for this purpose SKT Magazine shares entire compatibility when it comes to a wide array of useful plugins. Among them are NextGen Gallery and other portfolio or gallery plugins to enhance the look and visuals of your website and make your publications more informative and perceptible while being accompanied by high – resolution thematic images and photos. Disqus and Facebook comment plugins are another great way to build a broader audience and increase your revenue. Social media and social sharing plugins are also compatible with our template to sparkle engagement via social media platforms. In case you feel the need to test and review your theme specifications and standards, or to add shortcodes to your template, theme check and shortcode plugins are available for you as well. 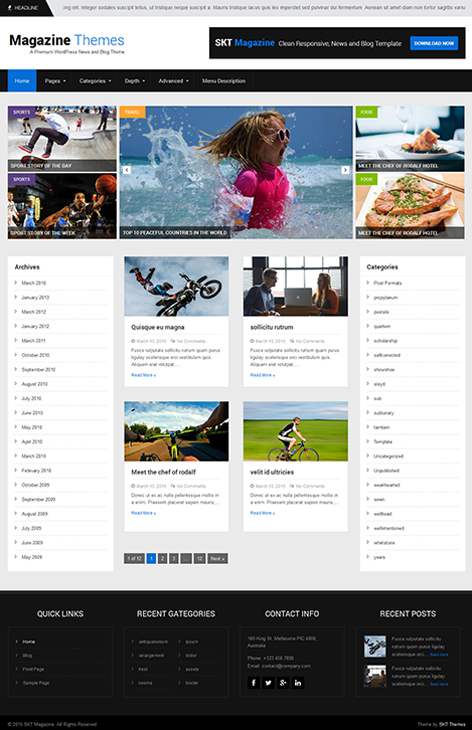 Powered by the standards of Codex, equipped with social media included footer, widget – friendly sidebar for advertisements or other supplementary pieces of content, this free magazine WordPress theme feels confident and self – assured when responding to any device or mobile preconditions and technical specifications for the optimized mobile or tablet viewing experience. Let all your website users or magazine subscribers get updates from your website or blog from anywhere and anytime via their portable devices since all your content and images will smoothly adapt to the suggested screen resolution with minimum drag and scale, reposition or adjustment.